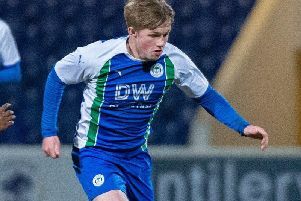 Christian Walton reckons Wigan Athletic’s ‘unbelievable firepower’ will prove ultimately decisive in the relegation run-in. Latics return to action this weekend against Brentford looking to continue one of the best home records in the Championship – in stark contrast to their form on the road, which is the worst in the division. But Walton says the manner of their last performance – a 5-2 derby demolition of fellow strugglers Bolton which pushed them three points clear of the drop zone – proved their attacking capabilities, and sent out a warning to future opponents. “We’ve got far too much firepower – as we showed against Bolton – to be in the relegation zone,” he told the Wigan Post. “Some of the forward play we’re capable of is unbelievable, the finishes last week were absolutely top drawer. “You look back to the way we started the season, and we need to get back to that on a consistent basis. The visit of the Bees is the first of an eight-game block that will make or break the campaign. Those fixtures include testing clashes against promotion-chasing Norwich and Leeds, play-off hopefuls Preston, Bristol City and Hull, as well as relegation-threatened Millwall and Birmingham. But Walton says league position goes out of the window at this time of year with most teams fighting for something. “It’s part and parcel of this league,” he added. “We had a really tough period of games over Christmas and New Year, and what was supposed to be an ‘easier’ run since then.